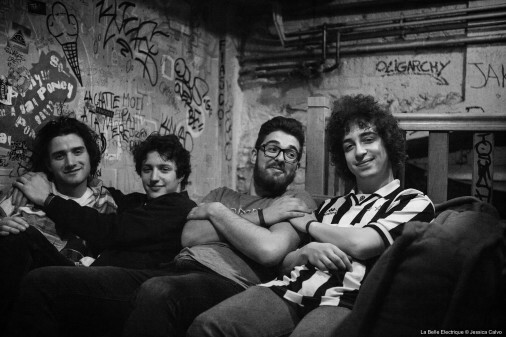 The Rag - JOHNNY MAFIA Drop New Track "Crystal Clear"
The garage-punk band Johnny Mafia hails from Sens, France–a part of the world more known for their wheat and cereal production than in-your-face rock & roll. On November 9th the group will release their sophomore LP Princes de l’Amour via the London-based label Dirty Water Records. The band just recently premiered “Crystal Clear" on Radio France's ultra-popular FIP station in Paris, our second listen in on the upcoming, Jim Diamond produced record. Mixing guitar-driven garage hooks with a high-octane grunge of low-end, “Crystal Clear is a collage of punk-laced influences; offering a youthful, snotty, explosive and ferociously fun energy that drives audiences into a near-frenzy. Inspired by classics like The Ramones, T-Rex, and The Clash, they also draw heavily on contemporary acts like Ty Segall, Jay Reatard, the Wavves, and Oh Sees. They have long been high rollers in the burgeoning post-garage punk rackets gripping the country of France over the last few years; high-energy explosive acts like The Scaners, Escobar,Les Grys Grys, Les Lullies and The Psychotic Monks have been burning up stages across Europe and USA with a vengeance! Last month the band completed their first ever North American jaunt, making an appearance at the prestigious FME Festival in Quebec and have established their reputation above all else on stage and over the last four years as a featured attraction across festivals in France; Festival Printemps de Bourges (FR) in 2014 and Festival Les Eurockéennes de Belfort (FR) in 2016 and were recognised with a laureat du FAIR in 2017. With their signature reverb-soaked slap-back fuzzed-out sonic attack, Johnny Mafia embodies punk attitudes and spirit of past and present with a firm foothold into their bright future as a young band ready to conquer the wider world of rock ‘n’ roll. MODERN MIMES Release New Video for Deftones cover- "My Own Summer"